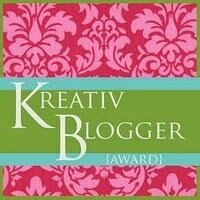 The following lovely bloggers have awarded me a Kreativ Blog Award. I feel very very loved - much needed - thank you beautiful ladies. I have a forklift license (it has expired though). Diesel and electric. I have one baby. A beautiful boy Aaron. I used to be able to down a pint of lager quicker than a boy and my nickname back then was Lager Lager. It was like a first and surname. So much so that people would and did abbreviate it to Lager. The first boy I kissed was called Cormak and we were 4 years old. I've had my tonsils out. Despite planning a water birth I had a C-section. Normally I love life but I am in a low patch at the moment. I love Japan and spent 16 days there in 2004. My heart goes out to them at the moment. I think I would love to be Budhist if I had time to think about it. I am a bit of a perfectionist. I am sooooooo tired so am not going to choose my 10 blogs tonight. Would like to be a Yummy Mummy! Been thinking about you, hope you are doing Ok? Just reminds me I have been awarded this award but can't remember who give it to me, that's bad! I also planned a waterbirth and ended up with a section, boo hiss.